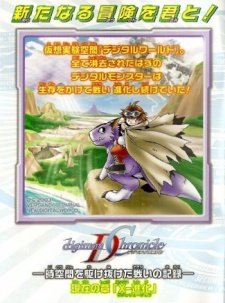 Digimon Chronicle was the storyline accompanying the 2004 Digimon product line. Originally rumored to be a new, full-blown manga to replace V-Tamer 01, it eventually transpired to be mostly prose text, printed in the booklets which accompanied the "Pendulum X" digital pets. These booklets also contained short, non-sequitur six-page manga. There are four "chapters", one sold with the Pendulum X 1.0, another with the Pendulum X 1.5, another with the Pendulum X 2.0, and the final chapter with the Pendulum X 3.0. This fiction tells the story of a Digital World controlled by a scientist computer named Yggdrasil. Because Digimon had multiplied so much in the past, Yggdrasil, the host computer, was unable to handle the load and the Digital Hazard occurred. Yggdrasil then created the "New Digital World," consisting of three layers for the past, present, and future - Urd, Versandi, and Skuld respectively - and then let loose with Project Ark and the X Program to eliminate any Digimon Yggdrasil no longer wanted. However, the Digimon adapted by obtaining a program called the X-Antibody, which strengthened them, changed their form, and made them immune to the X Program. Yggdrasil sent in the Royal Knights, thirteen Digimon devoted to keeping order in the Digital World, and at this point Kouta, Yuuji, and Shinji, three humans, somehow found their way into the Digital World and met their partner Digimon - Dorumon for Kouta, and Ryuudamon for Yuuji. Kouta and Yuuji resisted Yggdrasil and the Royal Knights, but Shinji apparently sided with Yggdrasil.